What is the basis of your work with parrots? How is it similar to work with children? The behavior-change technology called applied behavior analysis (ABA) forms the basis of my work with parrots and children. The first law of ABA, called the law of effect, describes the relation we experience every day between what we do and the environment in which we do it. That is, behavior is a function of its consequences, a purposeful tool. We behave to produce outcomes of value to us. Observing the immediate outcomes produced by our parrots’ behavior provides a lot of information about why an individual behaves as it does. 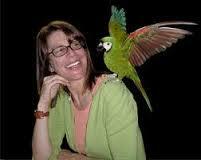 “Parrots are like 3-5 year old children. x cognitive tasks as do young children.” (seehttp://www.edge.org/documents/archive/edge126.html).